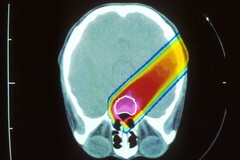 A proton beam from the brain during CT scans. Using dozens of CT slices, a computer produced this three-dimensional representation of the eyes and optic nerves (blue and green). The brain stem (green) , and the tumor (red). The yellow line shows the proton beam field-shaping aperture.